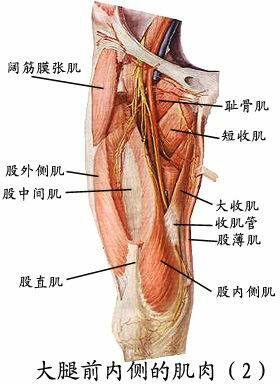 可分为髋肌、股肌、小腿肌、足肌。 Can be divided into the hip muscle, femoral muscle, calf, foot muscle. 位于髋关节周围，作用于髋关节。 Located around the hip joint, acting on the hip joint. 分前后两群，前群主要有髂腰肌，后群主要有臀大肌和梨状肌等。 Divided into two groups before and after the former group mainly iliopsoas, gluteus maximus and after the main group, such as piriformis. (1)髂腰肌：由髂肌和腰大肌组成，可使髋关节前屈旋外。 (1) iliopsoas: the iliac and psoas muscle composition enables external rotation of the hip flexion. (2)臀大肌：位于臀部浅层，大而肥厚，其外上1/4部无重要血管神经，是临床肌肉注射的常用部位。 (2) the gluteus maximus: Located in the hip shallow, large and thick, on the outer 1/4 of the Ministry of no major blood vessels and nerves, is a common clinical intramuscular injection site. 作用于髋关节，使其后伸和旋外。 Acting on the hip extension and external rotation after it. (3)梨状肌：能使髋关节旋外。 (3) the piriformis: make hip external rotation. 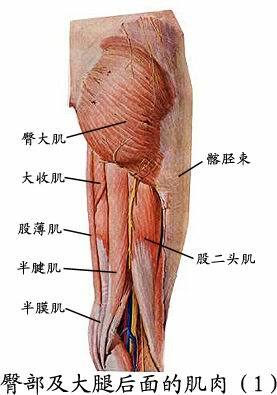 也称大腿肌，分三群。 Also known as the thigh muscle, divided into three groups. (1)前群 (1) before the group ①股四头肌，位于股前部，是膝关节强有力的伸肌。 ① quadriceps, located in front of the shares, is a powerful knee extensors. 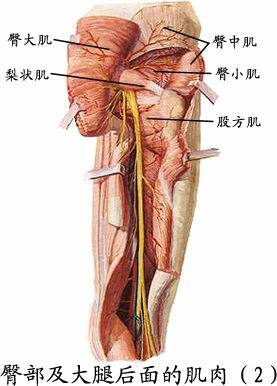 ②缝匠肌，呈扁带状，屈髋屈膝。 ② sartorius, Chengbian ribbon, hip flexor knees. (2)内侧群：为5块内收肌，即长收肌、短收肌、大收肌、耻骨肌、股薄肌。 (2) the medial group: within five adductor muscle, namely the long adductor muscle, short adductor, adductor magnus, pubic muscle, gracilis. 均可使髋关节内收。 Can make hip adduction. (3)后群：共三块。 (3) After the group: A total of three. ①股二头肌、②半腱肌、③半膜肌，三肌均可屈膝关节、伸髋关节。 Biceps femoris ①, ② semitendinosus, ③ semimembranosus, three knee joint muscles can, stretching the hip. 也比较复杂，分为前群、外侧群和后群。 More complex, divided into groups before, and after the group outside of the group. 前群多为足的伸肌和内翻肌，后群多为足的屈肌和内翻肌，外侧群为足的外翻肌。 Mostly former group and varus foot extensor muscles, after the group more and varus foot flexor muscle of the outer muscle group for foot eversion. (1)前群：包括长伸肌、趾长伸肌、胫骨前肌等。 (1) before the group include:  longus, extensor digitorum longus, tibialis anterior muscle and so on. 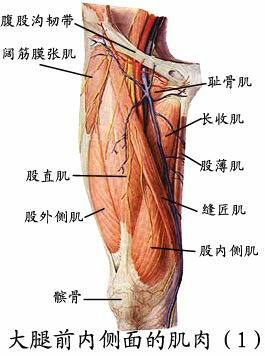 (2)外侧群：包括腓骨长肌、腓骨短肌等。 (2) outside of the group include: peroneus longus, peroneus brevis and so on. (3)后群：浅层为小腿三头肌，以跟腱止于跟骨。 (3) After the group: three shallow for calf muscle to tendon calcaneus ends. 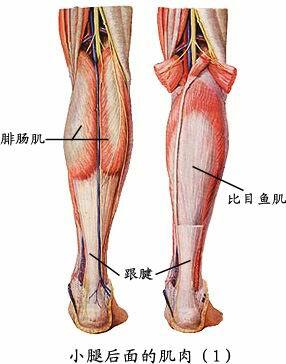 深层有趾长屈肌、长屈肌和胫骨后肌。 There are deep flexor digitorum longus,  longus muscle and the posterior tibial bone. 4． 4. 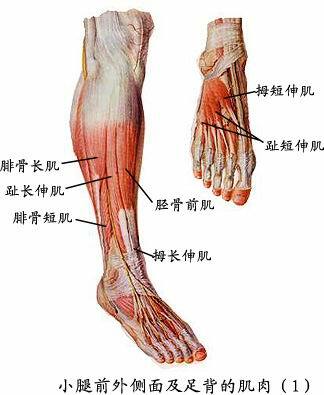 足肌：可分足背肌和足底肌。 Foot muscle: divided back muscles and plantar foot muscles.